With the triggering options you can change which mouse or keyboard events should the search box react to. Trigger search when clicking on search icon? - Will enable the search when the user clicks on the search icon. Trigger search when changing a facet on settings? 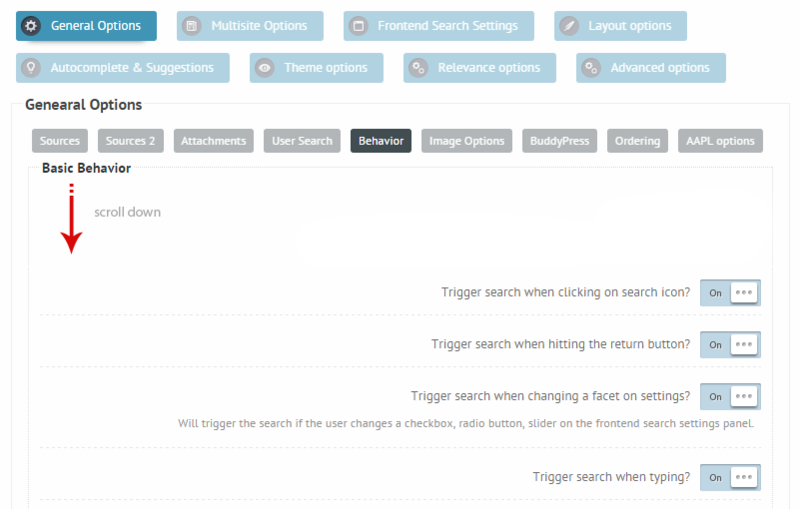 - Will trigger the search if the user changes a check-box, radio button, slider on the front-end search settings panel. Trigger search when typing? - Triggers the search when the user types in something. Minimal character count to trigger search - The minimum amount to start the search. Each option above respects this rule. Yes, you actually can. Set the Minimal character count to trigger search option to 0. This way the search will start without any input characters.